All the warm spices of cinnamon, nutmeg, ginger, allspice, and cloves combine with almost an entire cup of pumpkin in these fall inspired Pumpkin Coffee Cake Muffins! Topping off these pumpkin muffins is a buttery, brown sugar cinnamon crumble and a sweet maple glaze! Well, it happened. I broke open the pumpkin. Now we have pumpkin breads, desserts, etc. filling our kitchen counters! I’m still clinging on to summer, but I’m slowly getting ready for all things fall. This is actually the latest that I’ve posted a pumpkin recipe on the blog. I usually start earlier, so sorry if you’ve been waiting! 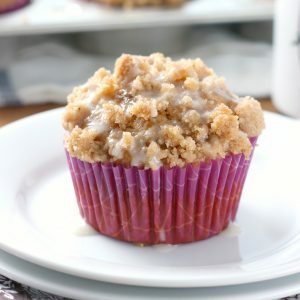 If you haven’t been waiting, I can guarantee that a bite of these pumpkin coffee cake muffins will start to get you in the mood for fall! All the warm spices of cinnamon, nutmeg, ginger, allspice, and cloves combine with almost an entire cup of pumpkin in these fall inspired muffins. With all of the pumpkin packed into these muffins, you’ll find that they’re anything but dry. No dry, tasteless muffins here! Topping off these pumpkin muffins is a buttery, brown sugar cinnamon crumble. Lots of it. While that would be good enough, I snuck in a little maple flavor by drizzling the muffins at the last minute with a maple glaze. I think pumpkin maple may be my go-to combo this year! Enjoy one with a big cup of coffee (or tea! 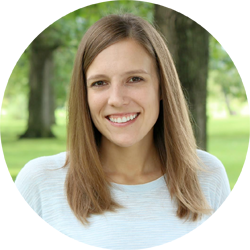 ), and get ready for fall! In a large bowl, whisk together flour, sugars, baking powder, salt, baking soda, cinnamon, nutmeg, ginger, allspice, and cloves. In a small bowl, whisk together milk, pumpkin puree, butter, and egg. Add wet ingredients to dry ingredients and stir until just combined. Fill muffin cups about ⅔-3/4 full. In a separate bowl, whisk together flour, brown sugar, and cinnamon. Cut in butter until mixture resembles coarse crumbs. Place a heaping tablespoon full on top of each batter filled muffin cup. While muffins are cooling, prepare glaze. Stir together all ingredients for glaze until smooth. Drizzle over the top of cooled muffins. Serve. I am hooked on pumpkin too, so I’m loving all of the pumpkin recipes I’ve been seeing early in the season! These muffins look perfect, Jessica! Just what I need on this Monday morning! Yay for pumpkin season! I could start every single day with one of these muffins. That maple glaze sounds incredible too. Bring on more pumpkin! Umm, dude, you have no idea how much I want this right now! Pumpkin ALL THE THINGS! I still have yet to start with pumpkin yet – I’m too stuck on apples! But these muffins!! Stashing this away so I can make soon!! 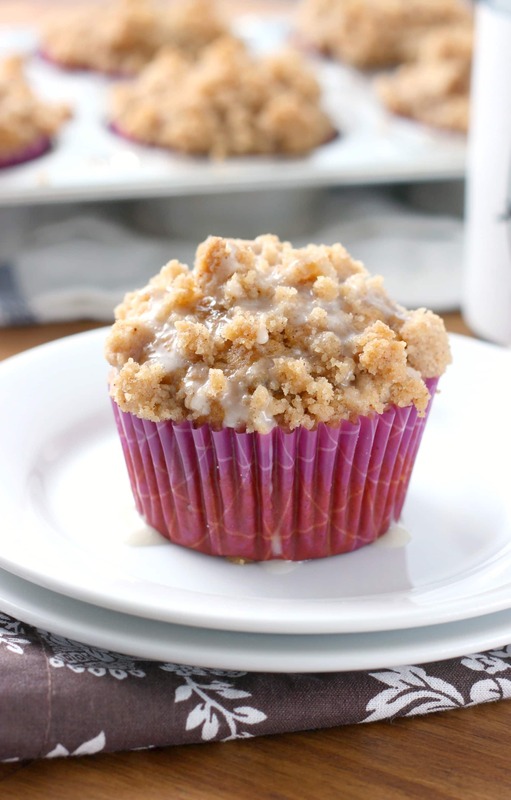 One of these muffins and a big cup of coffee sounds like the perfect way to start the day! 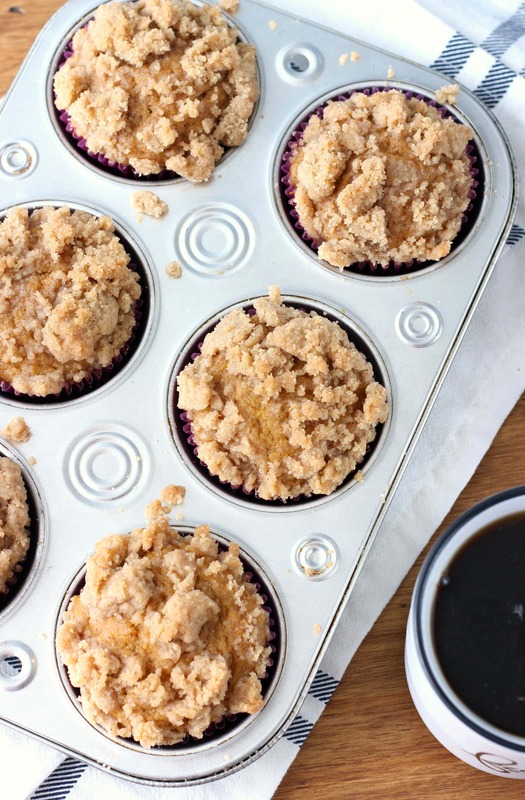 I love that you’ve turned coffee cake into muffins…and pumpkin to boot! I’m in! I am so ready for pumpkin. These muffins have crumbs and glaze! Yes, please. These are gorgeous!!! What a great yummy recipe. That crumble on top is swoon worthy! Oh my gosh!!! I am ready for the weather here to cool down so that it feels “pumpkin appropriate.” I don’t know why, but I have self imposed rules around pumpkin. The biggest one being that it has to at least feel like fall!! 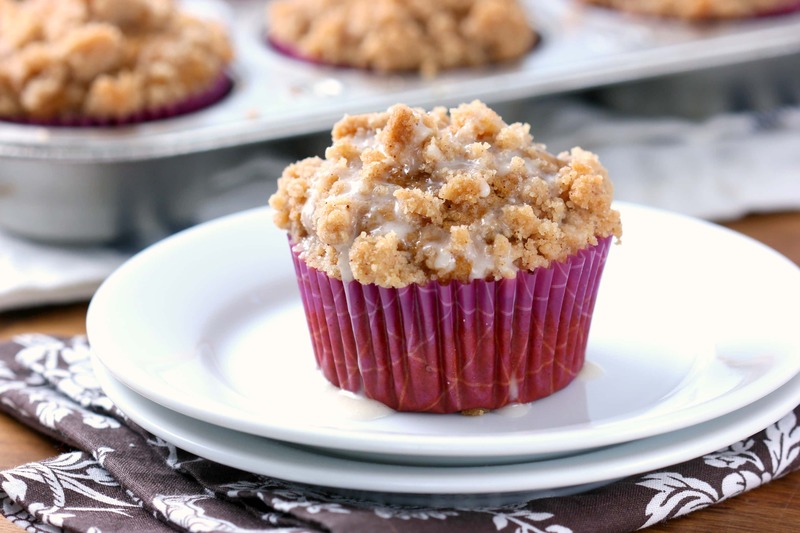 I am pinning and making these as soon as “appropriate!” 😉 Maple and pumpkin are meant to be, and streusel topping makes everything better. I will probably even double it! !